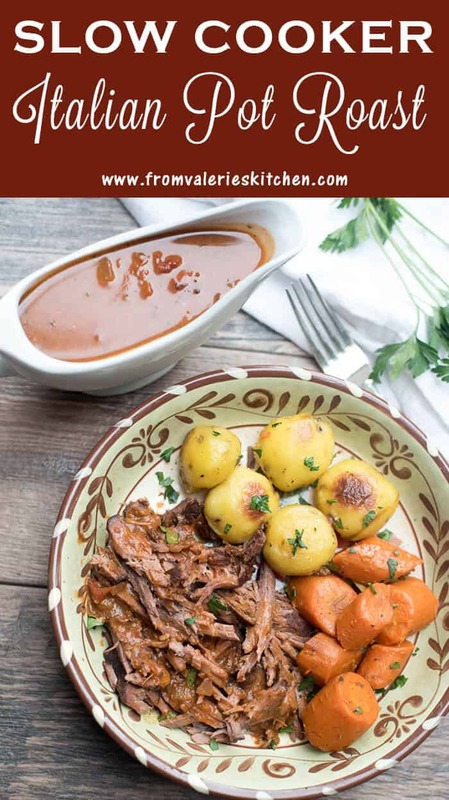 Slow cooked in a delicious sauce mixture with carrots, this Slow Cooker Italian Pot Roast has become one of my new rustic fall and winter favorites! Hi guys. I’ve got something real special for you today. 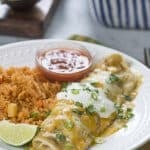 I was so thrilled with how this recipe worked out that I’ve been itching to get it out to you and today is the day! 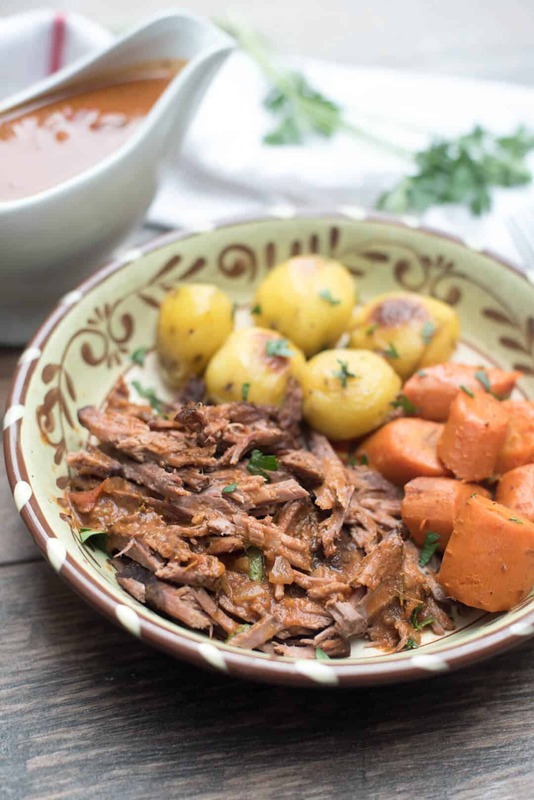 It starts with a lean roast and roughly chopped carrots that cook low and slow in a mixture of delicious but simple ingredients. 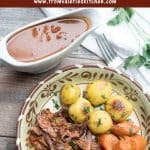 One of the things I love most about this recipe is the sauce that is created as the roast cooks in your slow cooker throughout the day. It is ready to pour and serve with no thickening and no skimming of fat. It’s luscious and it is delicious! 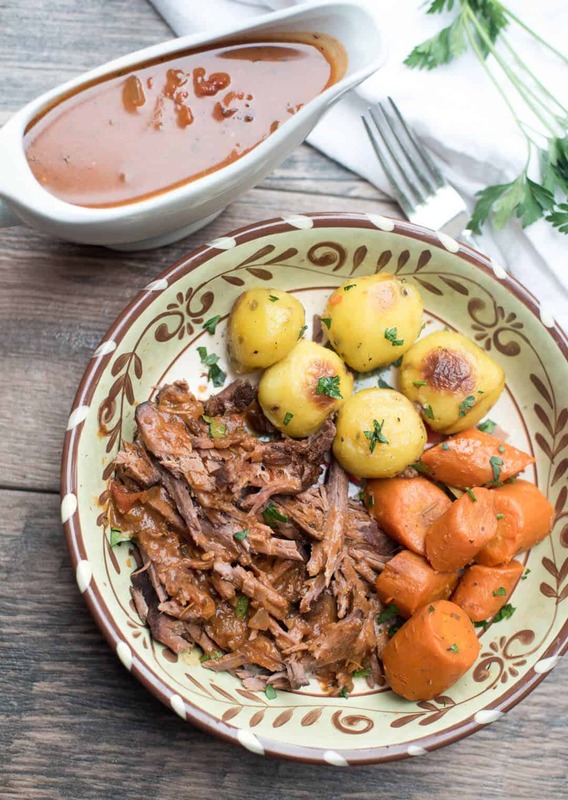 This dish is similar to the pot roast that most of us are very familiar but with a nod to Italian flavors including a rich, tomato based sauce and an assortment of dry herbs. Start by seasoning your roast with salt and pepper and searing it on all sides in olive oil until nicely browned. 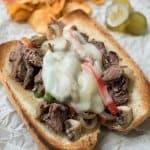 I’m specifically calling out a boneless top round beef roast here but you could go with an eye of round or rump roast. Stick with one of these lean cuts for the best result. 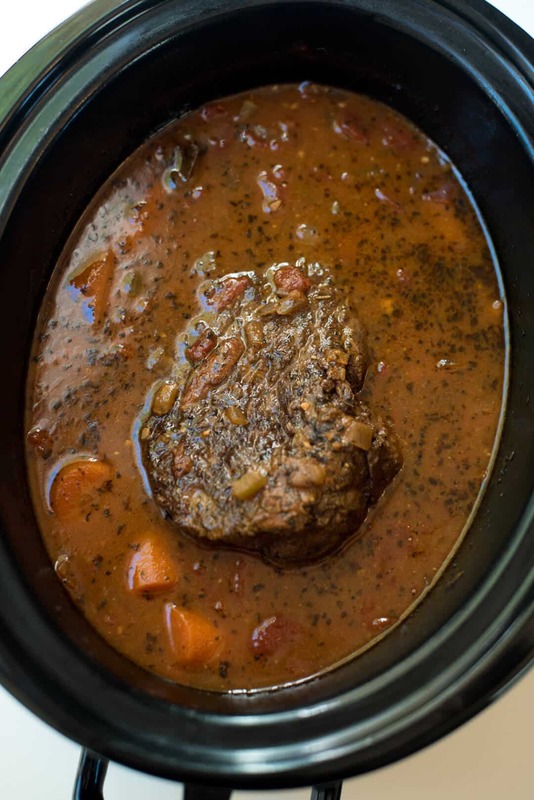 As much as I love a good chuck roast, I would not recommend it for this recipe as it’s a very fatty cut and we want an effortlessly clean, ready to serve sauce. 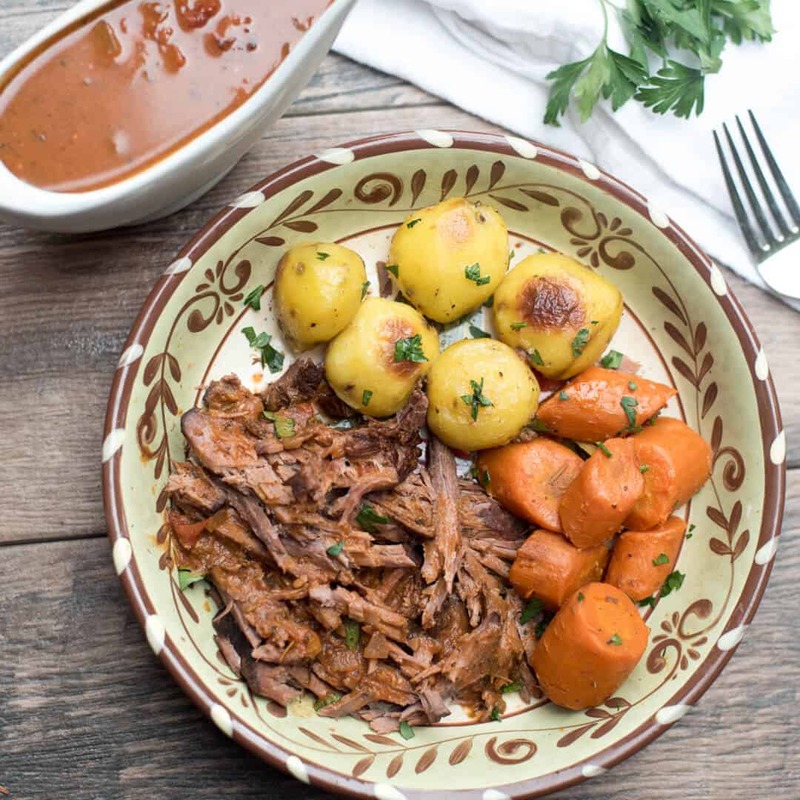 If you do go with a chuck roast I’d recommend that you chill and skim the sauce of fat before serving. 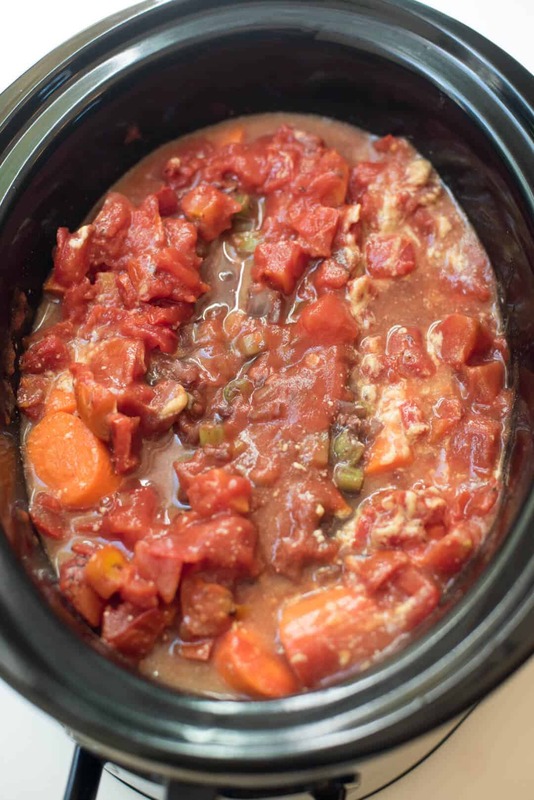 You may have heard that you shouldn’t use a lean cut in your slow cooker. Forget that! 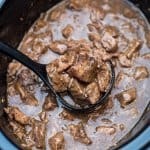 I’ve had a great result with lean cuts, especially with this recipe. 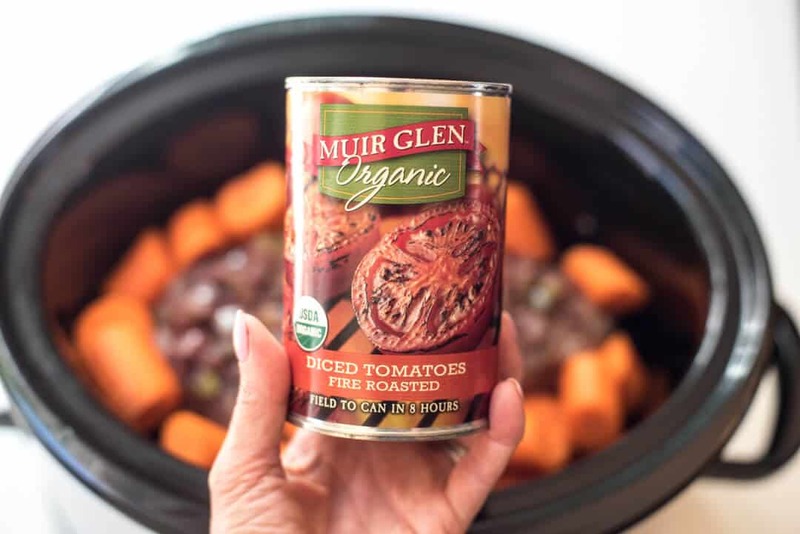 Transfer the browned roast to your slow cooker and then give the veggies a quick saute´ in the same pan. 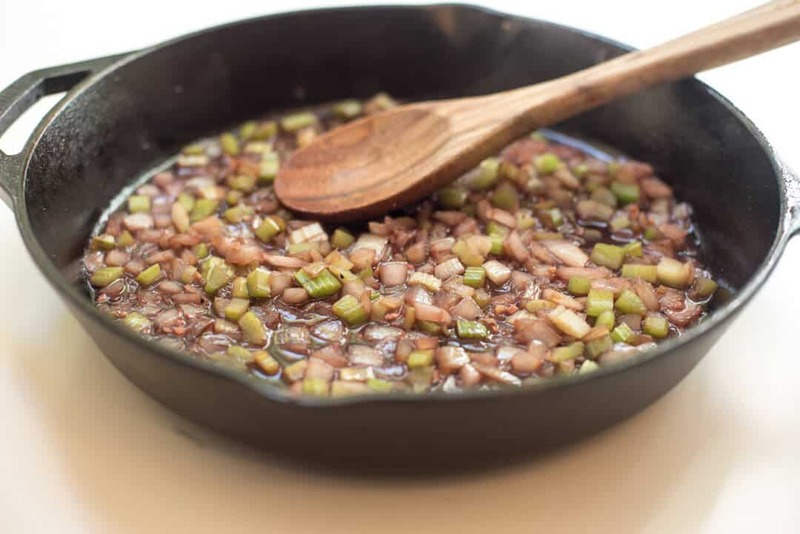 Chopped onions, celery, and minced garlic. 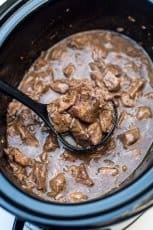 Add 1/2 cup of nice red wine (if you wouldn’t drink it, don’t cook with it) and cook, stirring to deglaze the pan and scraping up any browned bits of roast as you go. 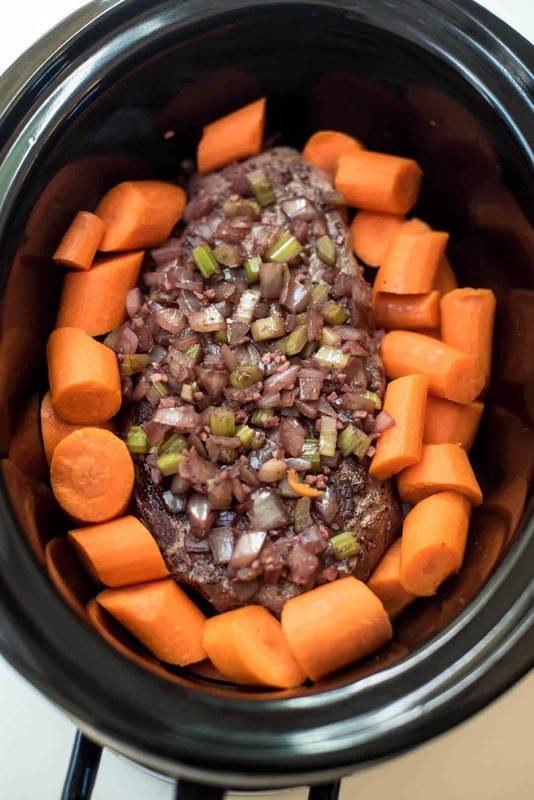 Pour the sautéed vegetables over the roast in the slow cooker and add the chunks of carrot. Next up – a can of fire-roasted diced tomatoes. 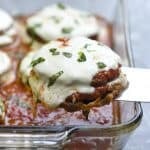 Pour them right over the top along with an 8 ounce can of tomato sauce. 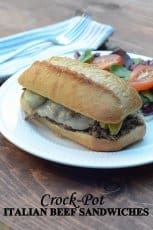 In goes a cup of low-sodium beef broth that has been whisked together with a little Dijon mustard and Worcestershire sauce. 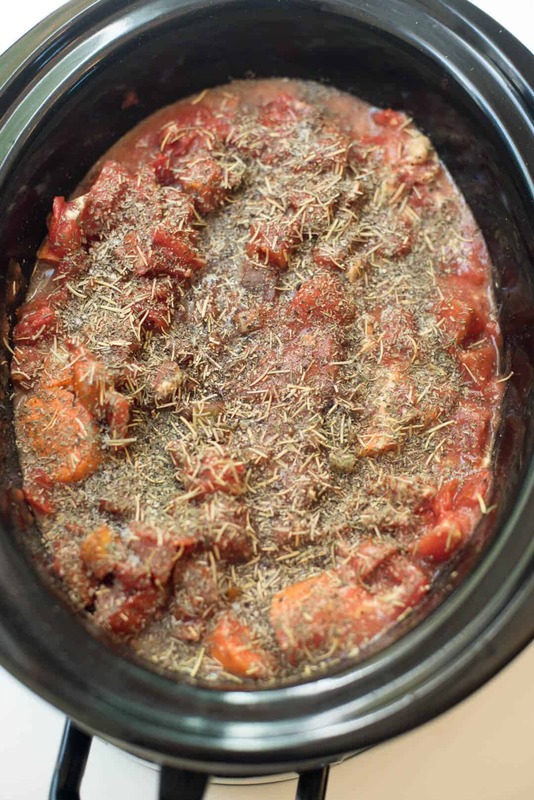 The seasonings come next – dry rosemary, thyme, basil, and a little salt and fresh ground black pepper. Tuck a bay leaf into the mixture, cover and cook on LOW for 7 to 8 hours or on HIGH for 4 to 5 hours. 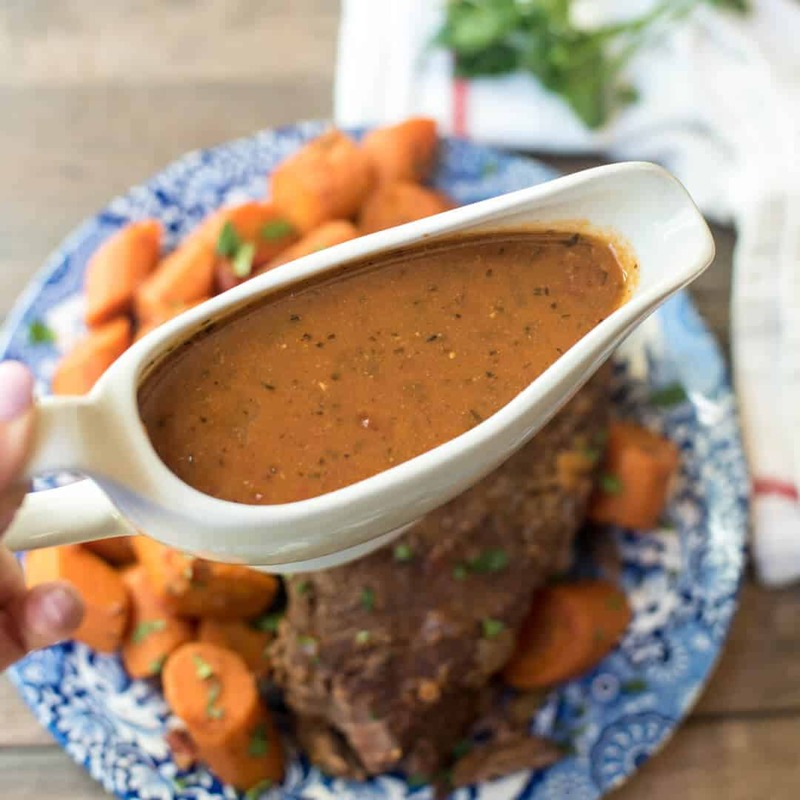 Such a beautiful thing to come home to – a beautifully cooked roast and carrots with a to-die-for sauce. It’s perfect served with potatoes! Especially these Garlic and Butter Broth Roasted Potatoes. Season both sides of beef roast with salt and pepper. 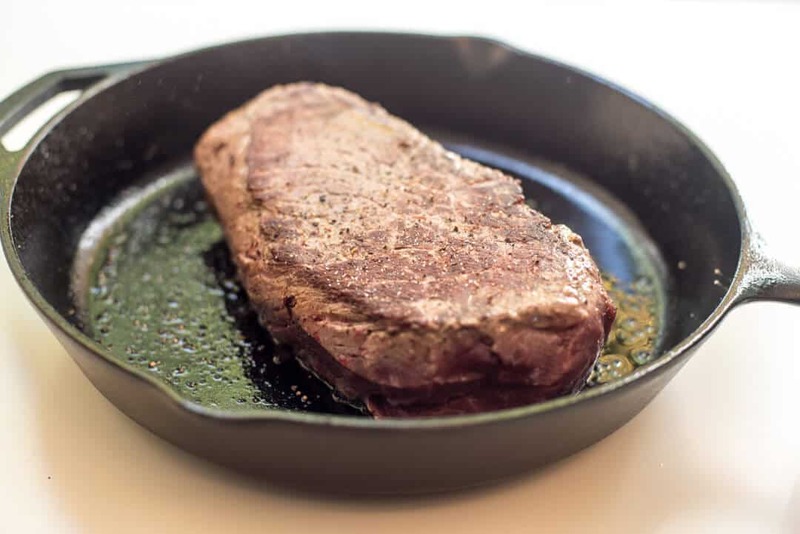 Add olive oil to a large skillet and place over MEDIUM-HIGH heat. Add roast and sear for a few minutes on each side, or until nicely browned. 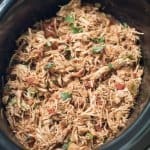 Remove from heat and transfer to 6 quart slow cooker. Return skillet to heat add additional olive oil, if necessary. 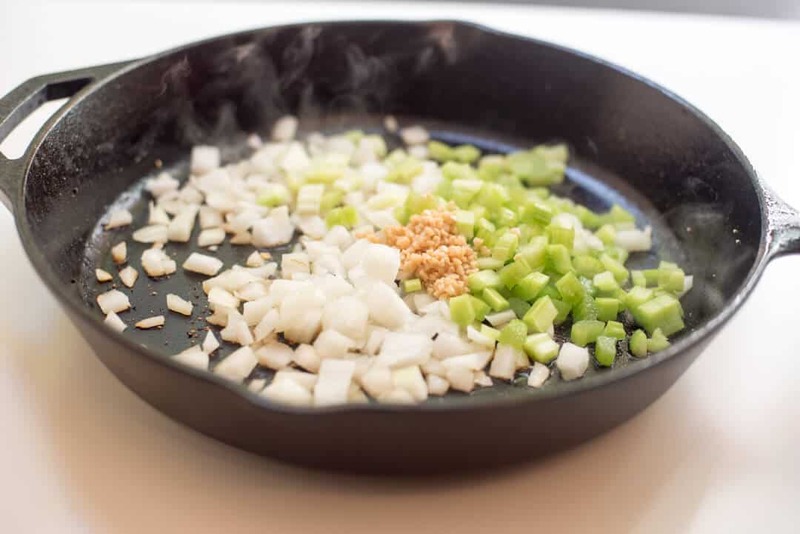 Add diced onion, celery, and minced garlic. Cook and stir for a couple of minutes and then and add red wine. Cook, stirring to deglaze the pan for just a minute or two and then transfer the contents of the skillet to the slow cooker with the roast. 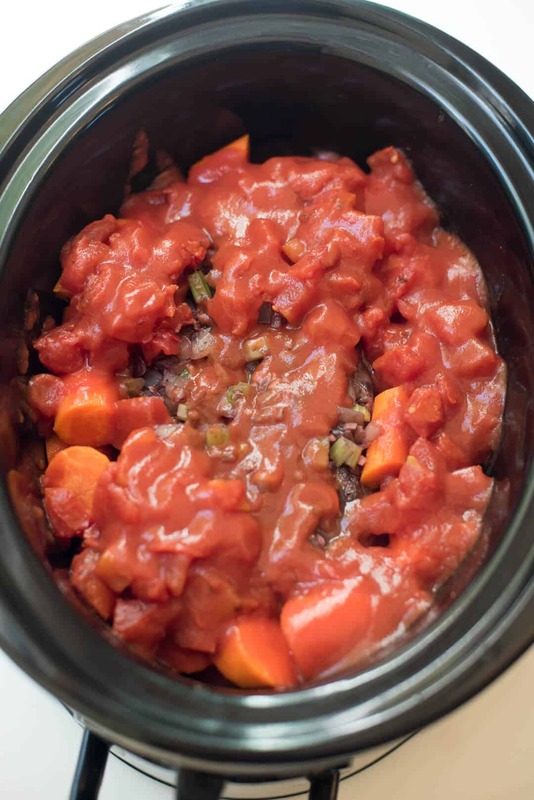 Scatter the carrots over the top and pour the diced tomatoes and tomato sauce around the roast. 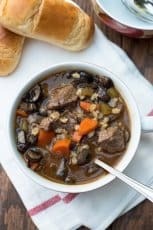 Whisk together the beef broth, Dijon mustard, and Worcestershire sauce in a measuring cup or small bowl. Pour the mixture around the roast. Sprinkle rosemary, thyme, basil, salt, and pepper over the roast and tuck a bay leaf into the sauce mixture. Cover and cook on HIGH for 4 to 5 hours or on LOW for 7 to 8 hours. Slice against the grain and serve in chunks or shredded with the carrots and sauce. Garnish with fresh parsley, if desired. this is absolutely beautiful! 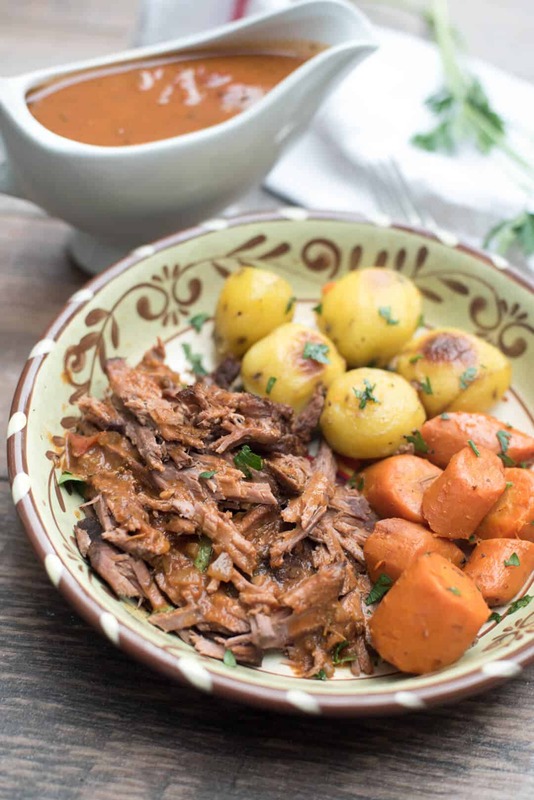 I love pot roast but have never made a version like this before and I need to! Hi Nancy. The carrots are added just after you pour in the sauteed veggies. The recipe card has been updated. Thanks! First, do you have a recipe available for the potatoes? They look fantastic. Also, the gravy. 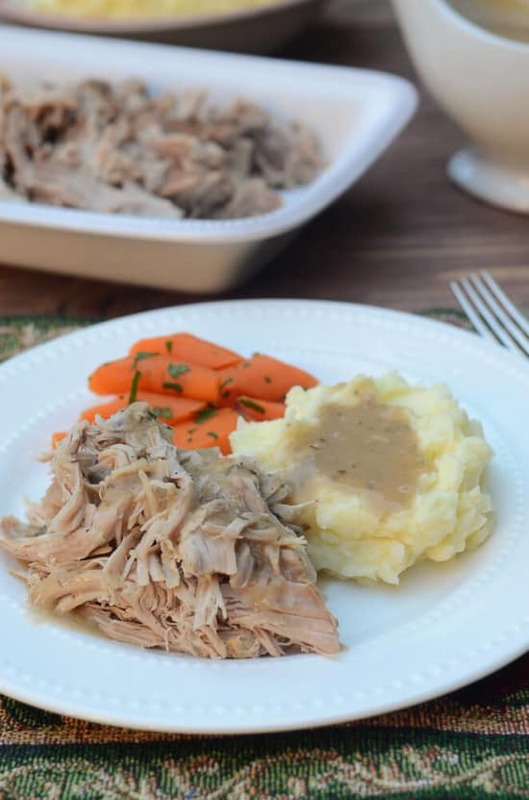 Is the gravy the remaining sauce in the pot after the roast cooks, or is that made separately, adding flour or ? Thank you so much for recipe, it looks amazing and I’m looking forward to presenting it to my guests tomorrow night. Hi Alandra. I’m working on the post for the potatoes and will be sharing it soon so check back! And, yes, the sauce is ready to serve without any additional thickening or skimming of fat if you use the cut I’ve recommended here. 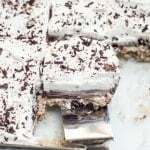 That is one of my favorite things about this recipe! I hope it works out well for you. Update! The recipe for the potatoes is here —> Garlic and Butter Broth Roasted Potatoes. Do you have the recipe for the side of potatoes? I’ve been checking back periodically since I found this recipe (which is delicious by the way). I haven’t gotten around to publishing that potato side recipe yet but I have it on my list! I’m so glad you enjoyed the roast, Marissa, and thanks for checking back. I’ll get this recipe up as soon as possible. Hi! I was wondering if you maybe have a suggestion for a substitution for the mustard? I have a lot of dietary restrictions unfortunately. Thanks!